Haven’t been posting for a few days now. I’ve been working on cleaning up a few things in the saving code. I’ve also fixed the background of the inventory and the code for picking up items. Going to be posting an explanation in the next couple of days. The reason I’ve been too busy in the last couple days is because of my other hobby, choir singing. I sing in the student choir of the University of Gothenburg. On Friday we had a gig which went really well and then on Saturday we had our last party of the semester. 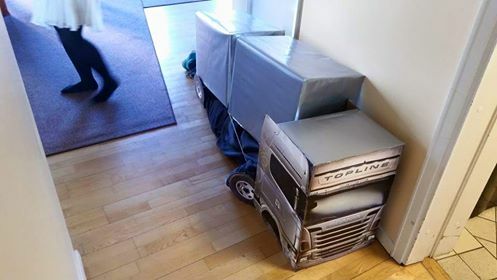 The theme was “elementary school dance”, so I went as a truck. A solitary killer, the truck stalks its prey. I was quite pleased with the outcome, but it was very hard to walk around with. Anyways, that’s why I haven’t been posting. Check back later in the week. Edit: I posted the image to Reddit and got quite a lot of karma (/r/Sweden). Yay!